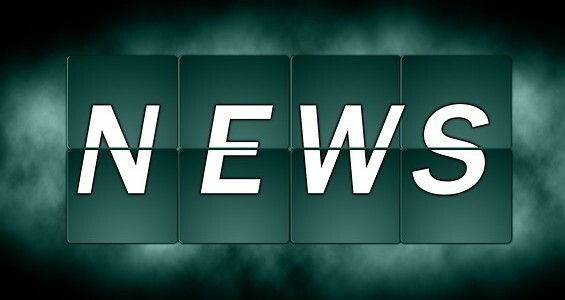 This article was originally posted on 7th April. 2018, but is kept up to date to reflect the results each year. Saturday 17th February 2018 saw the second Bellahouston Mob match at Pollok parkrun between Bellahouston Road Runners, and Bellahouston Harriers, with a fantastic 134 club members completing the distance, many more supporting their club or helping with the event. The first took place on 4th March, 2017, with 98 runners. Whilst inter-club races, and “mob matches”, are not new, they do appear to have fallen by the wayside a little, certainly in the Glasgow area and elsewhere in Scotland. We’re hoping that the great reception to the event in both years so far, and the hugely positive comments from club members that we’ll be able to encourage other clubs to give the format a try, and hope that what follows here can help with that. The actual result felt secondary to the atmosphere and camaraderie on the day: We’re hoping it painted a positive and welcoming picture of what belonging to a running/athletics club and local community can bring, and that prospective new members might be encouraged to join our respective clubs. We’re mindful though that given the event we are taking part in is staged by parkrun volunteers, it’s important that we recognise the work they do to put the event on, and work with them to minimise the impact the mob match can have. Our club also has two of the current Pollok core team, as well as the previous Event Director, amongst it’s members, which helped with considerations/awareness of issues. Inter-club races used to take place a great deal in the early years of organised athletics, but focus gradually shifted to organised races and county/regional races, as well as commercial races with a mass-participation focus. Perhaps a function of the increased logistical challenges involved in staging a race, from permissions to insurance, to available volunteers, to an already packed calendar of events, informal inter-club races ultimately faded away. With the advent of parkrun however, almost every large urban area now has at least one weekly, timed, measured, 5k run on it’s doorstep, that’s free to participate in. These events are popular for all the right reasons, and are have also become a popular route for recreational runners to take part in regular exercise in a supportive environment. Whilst it’s an increasingly important part of our grass roots sport, it’s important too that members of the public get to discover running clubs and groups to further develop their running. Many clubs who engage with these events, and events that engage with their local club community, see an upsurge in membership as a result of a solid and friendly regular presence at parkrun events, as volunteers and participants. Over time this works through to a broader involvement in organised athletics. The base of the pyramid that is so important, to foster and grow athletics talent. In the build up to our first mob match, the clubs respective Chairs/Presidents (Richard Leyton, Bellahouston Road Runners, and Tom Keenan, Bellahouston Harriers) had met to discuss ways our clubs could cooperate more, encourage interest in our respective clubs, and have a bit of fun in the process, and were both keen for an inter-club event of some sort. Having seen and heard of mob matches from friends in the London area (the very same friends in fact that introduced Richard to parkrun, who went on to start Pollok parkrun, Scotland’s first parkrun), we agreed it was a perfect mixture of fun and competition, that was already working well between for other clubs down south. This was reasonably straight forward. Neither club wished for the event to conflict with big races, the most notable of which was the National cross country event in late February. The week after seemed ideal for the first year, but after it’s success, the event was brought forward so that the mob match could become a bit of a ’sharpener’, and worked well as a consequence. The venue that made by far the most sense was Pollok parkrun, the first parkrun in Scotland, but most importantly the event local to both clubs, with the capacity to support the likely additional numbers. The parkrun regularly has 400-500 participants, and with the new year resolution surge typically fading by the end of February, any extra numbers were unlikely to cause the parkrun organisers any difficulty. Naturally we reached out to the parkrun team (several Road Runner club members were/are involved in the parkrun’s organising team, which made matters easier) and ensured they were happy with the proposition. We also ensured any issues raised after the event could be directed back to us. It was important to settle on the scoring system, and we settled on the http://www.bandbhac.org.uk/cross%20country.html#mob as a reference. Smallest team attendance, minus 3 gives the ‘counting positions’. Then tot up the finishing positions of each club, lowest wins. There was some last minute uncertainty as to whether we should use ‘parkrun positions’ (ie. record the number handed out to the runner at the end of the parkrun funnel), or finishing order relative to the other club. However, given the size of the parkrun event (and importance to keep well clear of the finish funnel to avoid interfering with the volunteers), and challenges to recording live finish order, we agreed to ask club members to present their parkrun finish barcode to a volunteer/teller from each club, who noted down the results. Club members were asked to wear identifying club colours. It’s important that members can see they’re ‘up against’ a rival. That every member of the club in attendance is helping to count. One of the most memorable parts of the event for many was the group photographs. A great opportunity for some friendly exchanges, and some great publicity material. Having a vocal photographer directing proceedings was useful. Our photographer was happy to offer high resolution photographs in exchange for a donation to a charity (Glasgow Humane Society http://glasgowhumanesociety.org/). Naturally some present may not wish to be photographed, so adhering to general parkrun guidelines regarding event photography are respected. As our first running of the mob match was social in focus, we arranged for a few spot prizes (by raffle), as well as a symbolic trophy for the winners. We’d considered a ‘digital trophy’ and/or ‘penalty’ (ie. a requirement to post a fun “we concede we lost, and that <the other club> have bragging rights for the next 12 months”) as options. In the second year, we continued the social focus (bacon/sausage/veggie rolls provided), and arranged for a commemorative buff, which was given to all club participants. We’d hoped to have enough spare to give to the parkrun volunteers on the day, but the event proved even more popular, and we ran out. A prize (bottle of wine) was also given to the last counting position from each club. All costs, for catering, prizes etc. were split 50/50 between the clubs. A precise definition of how the scoring system would work. We fixed this in the 2nd year, by preparing ‘tick sheets’ which made it easy for tellers to mark positions. Contingency for a parkrun cancellation/call off (adverse weather or other difficulty), and how club members would interpret that. We fixed this in the 2nd year by having a couple of fallbacks. there were a few last minute group photos that complicated the start area a little. the impact on parking (the resulting attendance was the 2nd largest for the event) was notable, presented the organising team some difficulties. Whilst complicated a little by building works taking place nearby, in future years we’ll work to highlight alternative parking arrangements for club members. We need to ensure all participants and supporters are mindful that most parkrunners are taking part for their own reasons, and that the impact doesn’t put people off. In future years we’ll be working with the parkrun team to ensure there’s a bit more publicity ahead of the event. parking was much better as members were encouraged to, and largely did, park at Cartha and outside the park. parkrun team put out pre-publicity about the match, so parkrunners could make an informed decision. Additional marshals out on the course too. Club members were encouraged to embrace the spirit of the event as primarily about fun and participation, with a competitive edge. All in all, it was a huge success and well received by everybody, and positive feedback from the Pollok parkrun team. See earlier note about Scoring. In brief, smallest club minus 3 runners are the total to count per club, then record finish positions (parkrun finish position tokens) for each runner, per club. Tot up total positions. Lowest wins. See here for a ‘scoring’ sheet the club teller used. 53 Harriers v 45 Road Runners, so a total of 98 members. So the Harriers ‘won’ attendance. 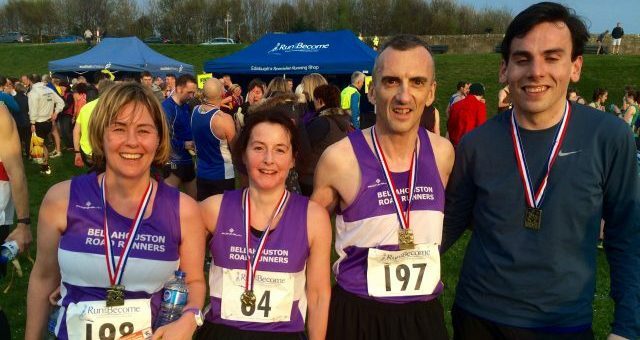 The Harriers (but not the Road Runners) had made the event part of their club championship. 1st, 2nd and 3rd males were Harriers, so Harriers ‘won’ the mens event on a 3-to-count basis. 1st, 2nd and 3rd females were Road Runners, so Road Runners ‘won’ the womens event on a 3-to-count basis. Based on finishing position scoring for smallest club attendance (Road Runners was smallest attendance, so 45-3 = 42), the Road Runners ‘won’ bragging rights from the mob match, and the main trophy. In a closer analysis the Harriers had better scoring in the first 100 or so finishers, but the Road Runners were much more closely packed in to the second 100 or so finishers. 71 Road Runners v 63 Harriers, so a total of 134 members. So the Road Runners ‘won’ attendance. The Road Runners made the event part of their annual club championship this year. 1st, 2nd males were Harriers, 3rd male was a Road Runner, so tighter at the front of the mens event this year, but on a 3-to-count basis, the Harriers won. Based on finishing position scoring for smallest club attendance (Harriers had 63, so 60 counting positions), the Road Runners ‘won’ (defended) bragging rights, and the main trophy. 60 Road Runners v 56 Harriers, so a total of 116 members. So the Road Runners ‘won’ attendance. 1st, 2nd and 3rd males were Harriers, so the Harriers won the mens on a 3-to-count basis. 1st female was visiting Jennifer Wetton from Central AC (who won the 2018 Jimmy Irvine 10k), and 2nd was a Giffnock North runner. The Harriers took 3rd. The Road runner ladies were closely packed thereafter, so the Road runners won the ladies on a 3-to-count basis. Based on finishing position scoring for smallest club attendance (Harriers had 56, so 53 counting positions), the Road Runners ‘won’ (defended) bragging rights, and the main trophy. However it was by any measure the closest result yet, and was really just a one runner difference in terms of points. We hope this outline proves useful to other clubs who might be considering organising something similar. Thanks to everybody who’s been involved in making the event a success, and many thanks again to our hosts at Pollok parkrun.